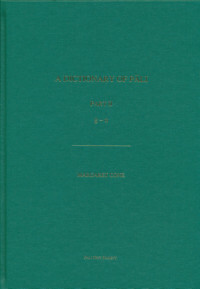 The second volume of a major new dictionary of Pali from the Pali Text Society. This is a truly significant publication for both Pali studies and Buddhist studies more generally. The first volume of Cone's dictionary covered the letters a-kh. Part Two thus represents the first substantial advance in Pali lexicography since the early 1920's, when the relevant portion of T.W.Rhys Davids and W.Stede's Pali-English Dictionary was first published. This dictionary has two main aims: first, to help its user read and understand the Pali Canon and its commentaries; and second, to provide a picture of the language, syntax, and even grammar of these texts. As of 2012, two volumes have been published: Part I (A-Kh) and Part II (G-N). Two further parts of this dictionary are currently being prepared (but may be a very long time before publication) and the Dictionary is likely to remain the principle lexical resource for scholars working with Pali texts for some generations to come.